I felt after three day of intensive knitting on the beautiful cardigan I needed a little break from that today. 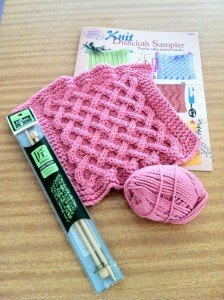 Years ago I had sent my Mum Sugar and Cream yarn by Lily yarns with a knitting pattern book and bamboo knitting needles to make a dishcloth for herself. Mum uses dishcloths every single day for everything and without a dishwasher they really get used a lot. When we got back to Adelaide and moved into this rental property all of my knitting stash was, and still is at sea somewhere. Little by little Mum has been giving me things from her supplies and this past week it included the yarn etc that I had mailed her which she had decided she was never going to use. 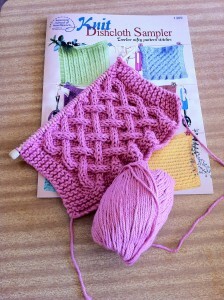 This morning I cast on for the dishcloth pattern called Weavings from the book photographed below. 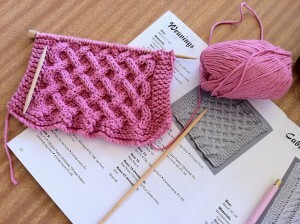 This is one of the nicest patterns I have done in a dishcloth because the amount of ‘weaving” or cables is making the fabric really firm.